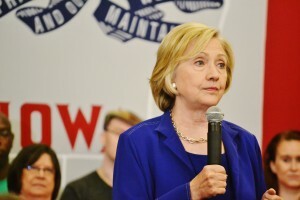 Hillary Clinton in Iowa City. Democratic presidential candidate Hillary Clinton met with about 60 people in an Ottumwa home late yesterday afternoon, a “house party” event that has become a staple of her three-month-old campaign here. Clinton told the gathering in Ottumwa that a “shortcut” to solving some of the nation’s vexing problems is to elect more Democrats. Clinton spent over half an hour shaking hands and posing for pictures with the Iowa City crowd, then she took questions from the media and she was asked about a recent poll which found support for rival Bernie Sanders had more than doubled, to about a third of likely Iowa Caucus goers. AUDIO of first 7 minutes of Q&A with reporters in Iowa City. Iowa’s Caucuses are scheduled for February 1, 2016. Clinton will return to Iowa next week, for an Iowa Democratic Party banquet. Bernie Sanders, Martin O’Malley and Jim Webb — her competitors for the Democratic Party’s 2016 presidential nomination — will be there as well.